John James Audubon was one of the great painters of the early American frontier. Born in Haiti to a French father and Creole mother, Audubon moved to America in 1806 and traveled extensively throughout the country painting watercolors of its beasts and birds, which he subsequently published in lavishly illustrated books. 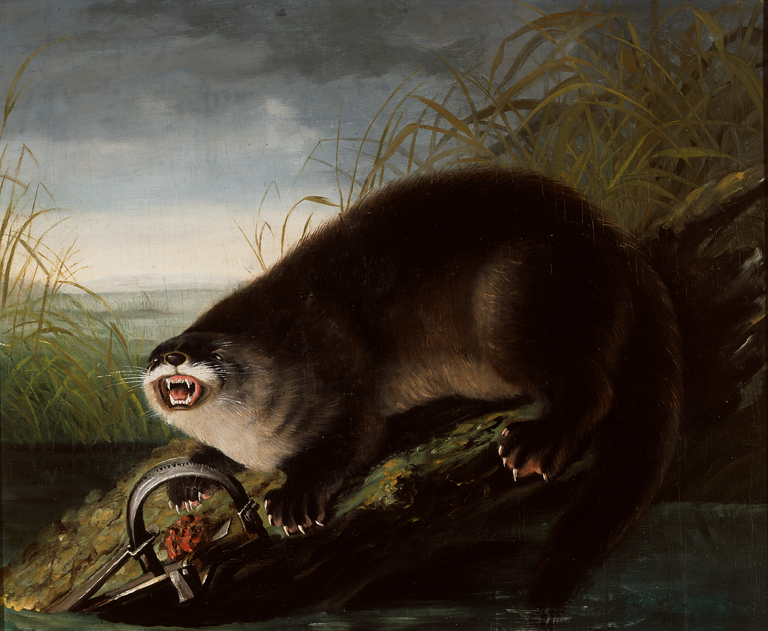 The artist based The Entrapped Otter on a watercolor he made in Kentucky in 1812; he adapted the image into several oil paintings in the 1820s and later reproduced it as a lithograph in his 1845–46 volume The Viviparous Quadrupeds of North America. Eastberg, John C. and Eric Vogel. Layton’s Legacy: A Historic American Art Collection 1888–2013. Milwaukee, Wisconsin: Layton Art Collection, Inc., 2013, pp. 314–15, 324, 461, color pl. 28, p. 314, color illus. pp. 315, 324, b/w illus. p. 324. Boehme, Sarah E. John James Audubon in the West: The Last Expedition, Mammals of North America. New York: Harry N. Abrams, Inc., in association with the Buffalo Bill Historical Center, 2000, b/w illus. p. 38. Foshay, Ella M. John James Audubon. New York: Harry N. Abrams, Inc. and the National Museum of American Art, 1997, b/w illus. p. 72. Milwaukee Art Museum. Eight Days in November. Milwaukee, Wisconsin: Milwaukee Art Museum, 1994, cat. 1. Goldstein, Rosalie, ed. Guide to the Permanent Collection. Milwaukee, Wisconsin: Milwaukee Art Museum, 1986, p. 101, b/w illus. p. 101. Reynolds, Gary A. John James Audubon and His Sons. New York: Grey Art Gallery and Study Center, 1982, pp. 35, 37 and 39, cat. 34, color illus. p. 35. Bland, D.S. John James Audubon in Liverpool, 1826-27. Liverpool: D.S. Bland, 1977, p. 9, note 7. Schinneller, James. Art/Search and Self-Discovery. 2nd. ed. Scranton, Pennsylvania: International Textbook Co., 1968, illus. p. 436. Miller, Lillian B. Patrons and Patriotism: The Encouragement of the Fine Arts in the United States, 1780–1860. Chicago: Universit of Chicago Press, 1966, pl. 6. City Art Museum of St. Louis. 200 Years of American Painting. St. Louis, Missouri: City Art Museum of St. Louis, 1964, illus. p. 14. John James Audubon’s Journals of 1826 and 1827. Animal Instinct: Allegory, Allusion & Anthropomorphism, John Michael Kohler Arts Center, Sheboygan, Wisconsin, October 10, 2010–January 23, 2011. Catesby, Audubon, and the Discovery of a New World: Prints of the Flora and Fauna of America, Milwaukee Art Museum, December 18, 2008–March 22, 2009. John James Audubon in the West: In Search of America’s Animals, Buffalo Bill Historical Center, Cody, Wyoming, June 23–September 24, 2000. Eight Days in November, Milwaukee Art Museum, October 15, 1993–February 6, 1994. John James Audubon and His Sons, Grey Art Gallery and Study Center, New York, April 26–June 5, 1982. 200 Years of American Painting, City Art Museum of St. Louis, Missouri, April 1–May 31, 1964.